Current projects along the Verde and San Pedro Rivers focus on linking wildlife to environmental flows and riparian habitat. 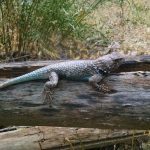 We have established research sites along the lower San Pedro and Gila River to study reptile and amphibian communities across three riparian forest types – cottonwood/willow forest, mesquite bosque, and non-native saltcedar stands. The goal of this project is to compare wildlife communities across forest types and evaluate species-habitat relations. Whether from climate change or increased demand from growing human populations, scientists expect less water to be available to maintain flows in perennial and intermittent streams. We are investigating how wildlife communities could change with shifts in vegetation responding to lower hydrologic flows. This study will allow our research team to evaluate which wildlife species might be winners and losers in a drying environment. Another project is in collaboration with the USDA Forest Service. 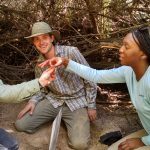 Collaborators include scientists from U.S. Geological Survey and Arizona Cooperative Fish & Wildlife Research Unit. 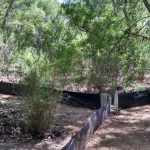 Our objectives are to relate instream flows to habitat characteristics along a desert perennial stream. My specific focus is to relate avian and herpetofauna species composition to riparian habitat. See our paper in Ecological Applications for more information.